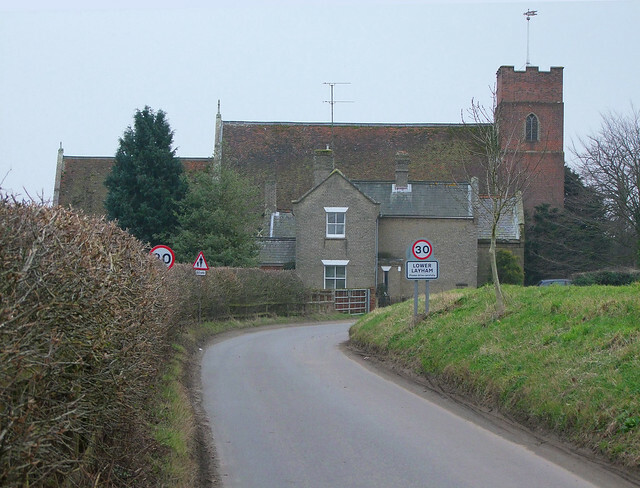 Not far from the outskirts of Hadleigh you reach Lower Layham at the end of a long straight road. The church presents itself broadside on, and the road goes circuitously around the churchyard, the ghost of an ancient track surviving in modern form. The churchyard is fronted by gorgeous iron railings, 19th century survivals that weren't vandalised during the Second World War. Most iron railings then were cut down, obstensibly to be turned into Spitfires, but perhaps it was really to help the English feel that they were doing their bit. St Andrew has little left that is medieval about it, but this is not necessarily a bad thing. It is a lovely example of a church that was well cared for both before and during the 19th century Anglican revival. The 18th century red brick tower is simple and seemly, with a late 19th century rebuilding of the parapet in the Suffolk crenellated style. The external walls of nave and chancel reveal 14th century origins, but all the window traceries were also replaced by the Victorians. The south porch is surprisingly small and perfunctory, but you enter a church which is at once homely and elegant. There is a feeling of it being much more spacious than it actually is. The one major medieval survival is the font, a fine example of the 13th century Purbeck Marble genre seated on a 19th Century base and columns. It is a little unusual in one respect, because instead of being square or octagonal it is hexagonal. There are other medieval survivals, including piscinas in both nave and chancel, but the main impression is of the late 19th and early 20th centuries. Most overwhelming of all is the elaborate reredos, which is absolutely gorgeous, and full of High Church power; Christ is seated in majesty, flanked by Andrew and John, and censing angels. Gables, pinnacles and niches rise above it, and the glass beyond is equally good. It is as fine an example as you'll find in rural Suffolk of the triumphalism of the Anglo-catholic movement. That movement has moved on, its tide receded, but at Layham it made its mark, and it is a good one.